You’ve just found the perfect environment to continue developing your idea into a business success. 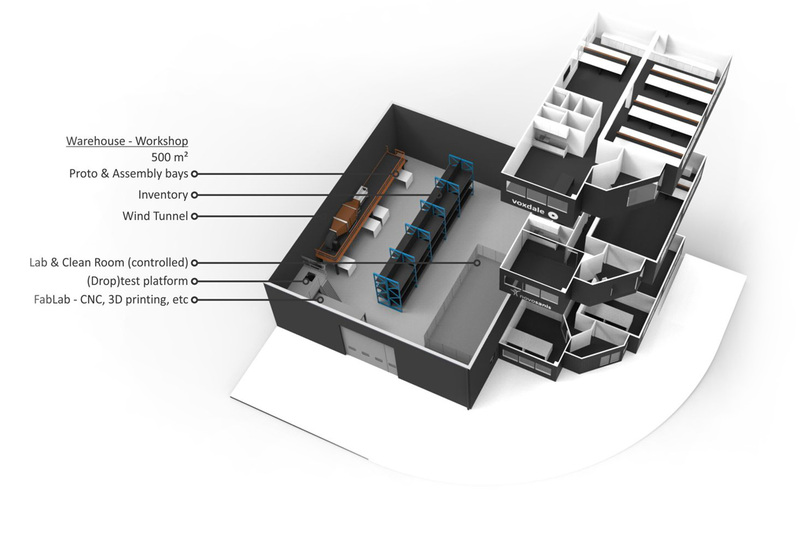 Not only desks, meeting rooms and other necessary facilities will be at your disposal, but above all you will be working amongst our passionate team of Designers and System, Product and Simulation Engineers, ready to support you when needed. Especially if you face challenges within product design & development, technology integration, IP creation, technological due diligence, and construction, testing and validation of prototypes. 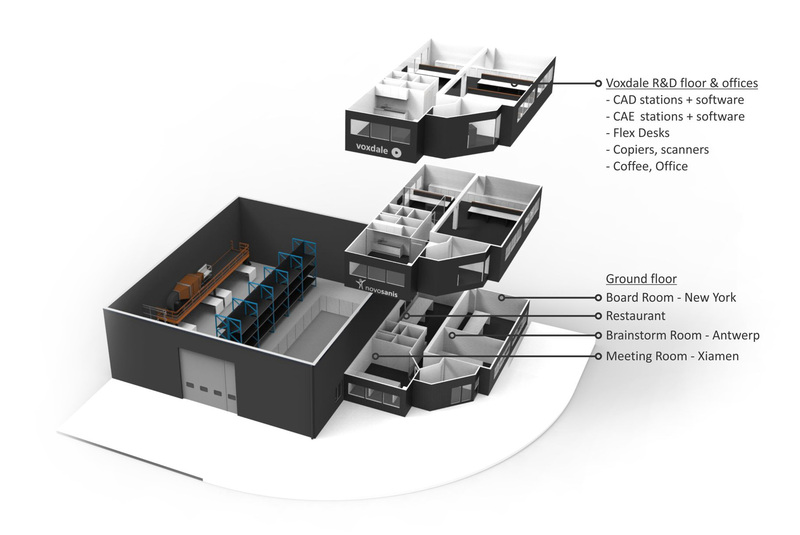 In addition to the privilege of drinking our delicious coffee, you will have access to CAD, FEA and Mentor Graphics FloEFD CFD tools, the R&D floor, fab lab with 3D printers and CNC equipment, controlled pressurized room, Bike Valley wind tunnel, testing platform for drop tests, ànd the excellent Hybrio Design network. Startups that have enjoyed and benefit from Voxdale’s approach and facilities are: MedTech companies like Ergotrics and Novosanis, Food technology start-up and Alberts, and ESA BIC spin-off SpacePal are just a few enthusiastic partners that are thriving on this technology incubation setting. We are happy to hear all about your needs. The Alberts Smoothie Station is the world’s first smoothie vending machine for personalized smoothies. Using pure ingredients – fruit, veggies and water – nothing else, a fresh smoothie is prepared on the spot in 90 seconds. The consumer can select a recipe from the touchscreen or make one via the mobile app. The Alberts Smoothie (Automated) Station makes healthy smoothies accessible to everyone, everywhere. on the spot. Personalized healthy smoothie in 90 seconds! Novosanis is an innovative developer and producer of medical devices improving the quality of diagnostic tests as well as the accuracy of drug delivery for infectious diseases and oncology. an innovative developer and producer of medical devices improving the quality of diagnostic tests as well as the accuracy of drug delivery for infectious diseases and oncology. Ergotrics specializes in positioning and moving patients with compressed air. We design and produce inflatable positioning devices, which tilt and lift patients quickly, easily, ergonomically, hygienically and safely. Ergotrics develops and manufactures products which allow for the optimal positioning or moving of patients. Without heavy physical labour and with special attention given to ease of use and hygiene. SpacePal is a Voxdale spin-off. Thanks to the ESA Business Incubation Centre Flanders status, the best technologies available are incorporated into new products, offering the finest hard & software solutions for global needs. SpacePal’s first product is the SewerMapper, which tackles risky and inefficient sewer inspection and inventory. SpacePal is also being accelerated through the imec.istart programme since March 2018!